Happy Cinco de Mayo...in September! 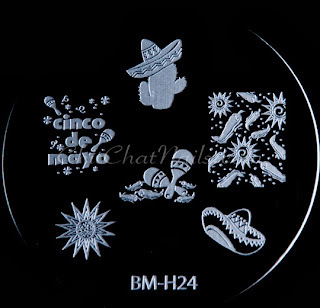 Bundle Monster's holiday stamping collection has all sorts of interesting holiday choices, including a Cinco de Mayo plate! I literally laughed out loud when I was flipping through the plates, so I absolutely had to use this one. I went full Mexican with this as you can see! How cute is that plate? I will definitely remember it come next Cinco de Mayo! It's a holiday I am certain I don't celebrate traditionally (as you can see by my last Cinco de Mayo post), but it's all good and fun. The colors I used in my mani were Milani's Tainted in Red and Yellow Mark, which are both textured polishes. 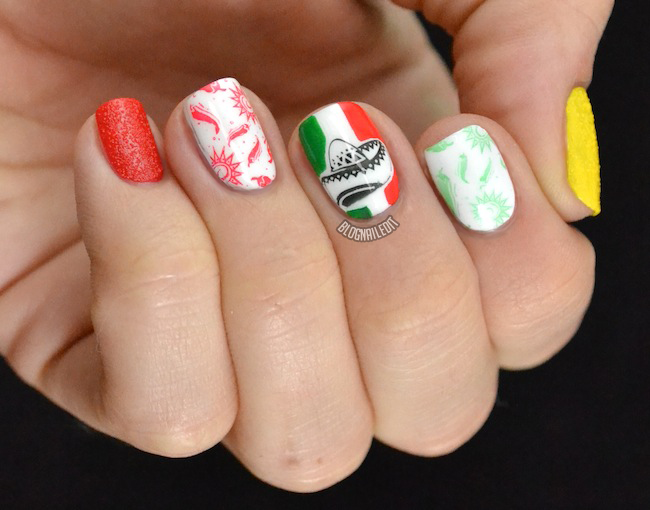 I also used a base of Purity (Zoya) and stamped with Posh (Revlon) and Tasmanian Devil Made Me Do It (OPI), which made the stripes of the Mexican flag as well. 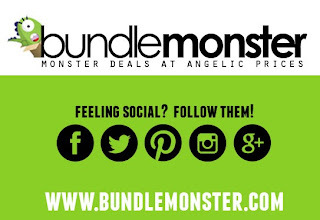 You can pick up the entire Bundle Monster holiday collection of 25 plates on their site for $21.99. Bundle Monster also recently released a collection where users turned in and had their own designs created on plates! That collection of 26 plates runs at $16.50 here. Check up with them on Facebook, Twitter, Pinterest, Instagram, and Google+!